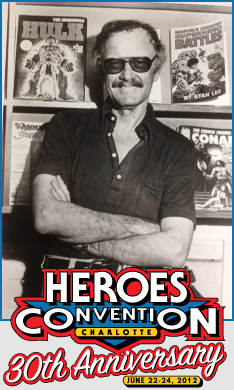 THE HEROESONLINE BLOG | HEROESCON 2012 :: STAN LEE’S Signing & Photo Schedule! HEROESCON 2012 :: STAN LEE’S Signing & Photo Schedule! Because YOU demanded it, and because you sent a million emails to both us and Stan asking for it, Stan Lee will be extending his stay at HeroesCon until Sunday afternoon! That’s right! The response to the True Believer pass was so strong that Stan didn’t want to disappoint anyone that wanted to meet him and get an autograph or a photo taken with him! All VIP pass holders will have 2 days of opportunity to meet Stan “The Man” Lee! Below is the full signing and photo schedule. If you were thinking about getting a True Believer pass, do it now. They are still on sale, but obviously for a limited time! So I have a VIP pass. Do I need to go through 2 lines to get a picture and then an autograph? When will a price list for autographs and photos be announced? So I also have a VIP pass but I need two items signed. Can I pay an additional fee ($50?) and get it signed at the same time? Or do I have to go through Desert Wind Comics for $55 and get in another line? How long will Mr. Stan Lee be signing autographs on Sunday starting at 1:00pm? Until the end of the convention day? Also, if I have the desert island “fast pass” does that mean I am in the “regular” line, or does that allow me to stand in the “VIP” line? Or does it just put me in/near the front of the “regular” line?